The 25th of January was a date that had been red-ringed in my calendar for many months now and not without good reason. Not only because it would mean the arrival of the long awaited January wage packet after scrimping since before Xmas, but because I wasn’t going to be at work that day, I was instead going to be a guest at Fuller’s brewery for a day courtesy of the fine folk from Cask Marque. 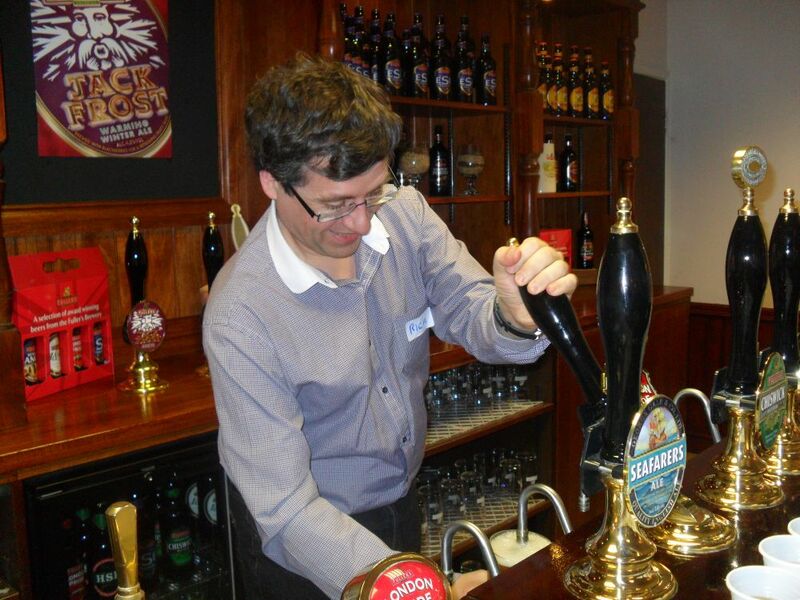 Fans of the Cask Finder app will know that the “top prize” is the honour of becoming a Cask Marque Ambassador for achieving 100 Cask Marque certificate scans but along with this awe inspiring title comes an invitation to visit a brewery and to spend the day on the Cask Marque Training Day course, just to see exactly what those who want their establishments to achieve the Cask Marque accreditation get up to. 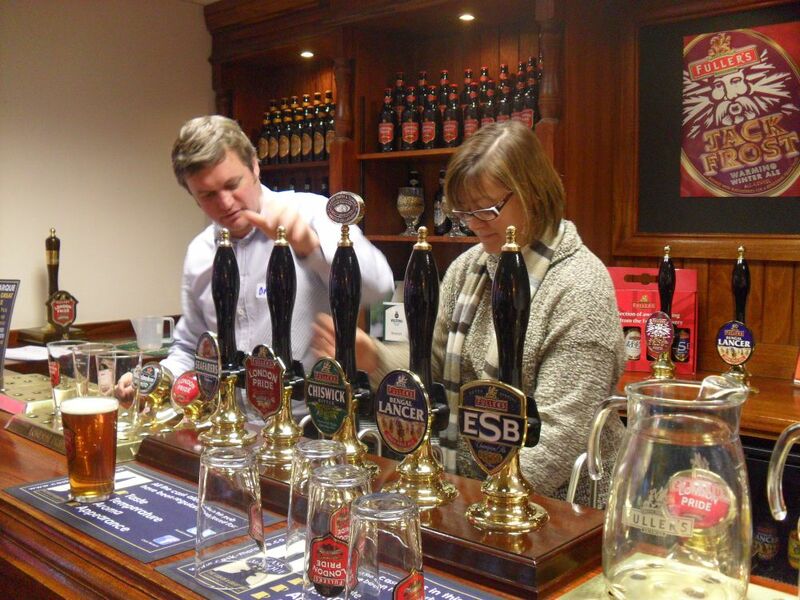 This was the first round of these Ambassadors’ courses and parallel courses were being held at the Black Sheep brewery in Masham and at Marston’s in Wolverhampton as well as the one at Fuller’s in Chiswick. 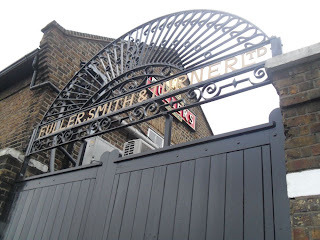 That gave Ambassadors from around the county at least a fighting chance to visit a more local brewery, although as it turned out, several of the chaps on my course in London had travelled from much wider afield than the South and South East. But for me the day started exactly as usual, catching the same rush hour train into Paddington, the only difference being I wasn’t suited and booted and having once arrived at Paddington I caught a west bound tube instead of an east bound one to the City. It’s a comfortable 15 minutes stroll from Turnham Green station to the brewery which is located adjacent to the busy A4 Great West Road but at least all the snow had disappeared meaning I was nice and early for the 09:30 start. Taking refuge in the brewery canteen (tea = 25p a cup!) I was just kicking myself for shelling out nigh on a fiver for a roll at Paddington station when I could have had a 6 item brewery from the canteen for £1.80 when some likely looking other chaps started to appear. Introductions were swiftly made (amazing how sociable us ale drinkers are!) 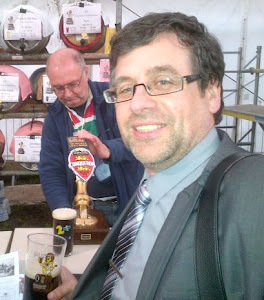 including that of the legendary Alistair Macnaught from Cask Marque who even recognised me as the BGC……………always a winner. Cask Marque's Alistair - He adopted this pose for the whole day! Alistair was accompanied by Natalie, also from Cask Marque and who tweeters and facebookers will know from the social media side of things. The final piece of the Cask Marque triumvirate was Day Harvey (yes, that’s the right way round!) who was going to be leading our course today. 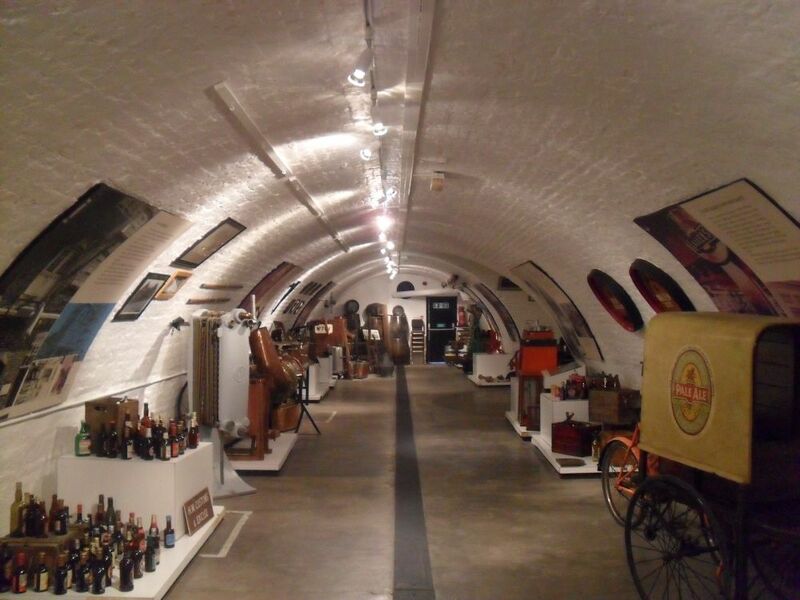 We were taken off to the training room and it was by far the best training I’ve even been in as it was mocked out to resemble the interior of a pub. And if that wasn’t cool enough, Day had also brought a long his own Cask Marque certificate which meant that we could all collect another scan. More official introductions were carried out as each of us in turn had to state where we were from, how long we’d been drinking cask ale and what our favourite beer was. Much joking around the second question (“too many years!” – “not long enough!” etc) ensued but as I say, it doesn’t take much for a bunch of ale enthusiasts to get to know each other. Day and Natalie demonstrate the equipment in the training room. Beats a projector any day of the week! Introductions out of the way, the day began with a tour around the brewery itself. Doning some very fetching hi-vis vests in the Hock Cellar tourist centre we began at the grist mill and finished three-quarters of hour later at the barrelling plant. I am rather skipping over the details of the visit mainly because I’m sure most readers of this will have either been on other brewery visits and let’s face it, the process of grinding, mashing, boiling, fermenting and casking doesn’t really change from plant to plant. What was very interesting about Fuller’s though, was the historical elements as this brewery has had to modernise around the listed and protected original brewery buildings. The other interesting element was the top facts picked up along the way. 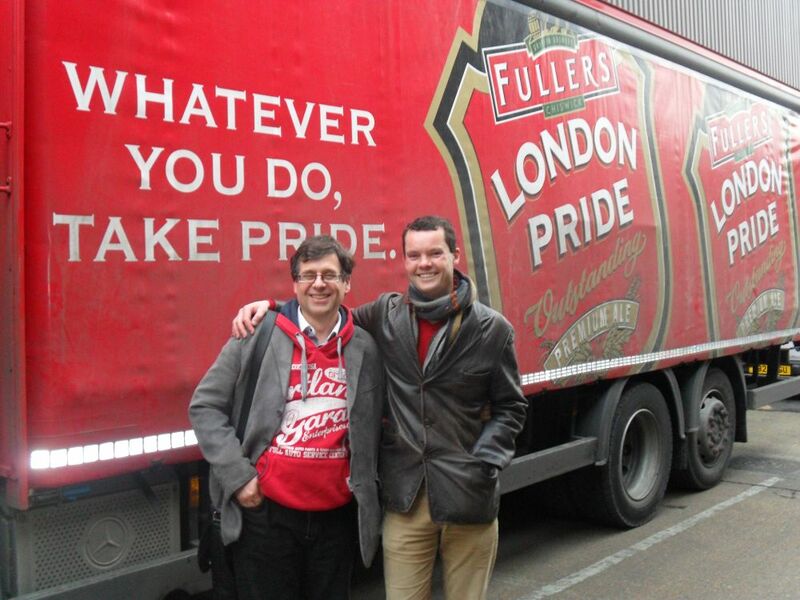 Did you know for example, that 80% of Fuller’s brewing time is spent on London Pride? Well it is, and that’s a beer fact! Retiring back to the training room, Day declared that it must be time for a beer but not before we’d been shown the process that a pub must carry out from receiving the new cask from the dray to the point that the beer is sold to the punter. Although it’s not rocket science it does prove that cask ale can live or die by what happens in this very final part of its journey and it’s also a reminder of that cask ale, especially good cask ale does require considerable more work than just connecting up a keg. 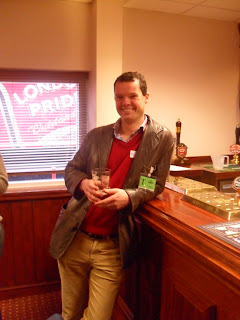 Well the proof, as they say, is in the pudding or in our case the pints of London Pride that we were now able to pull ourselves from the training room bar. Lunch was next with a well deserved (it’s hard work this brewery visiting you know!) fish and chip dinner on the Cask Marque tab before returning to the training room and a lesson in how to detect the things than can go wrong with beer and how to taste for these elements. Day, ably assisted by Natalie had set up 9 examples of “bad beer” using our cask of London Pride and adding some dastardly chemicals to make them “go off” – Our mission (and we all chose to accept it) was to taste these concoctions and try to work out what the off-taste actually was. Some were easy, the sour-vinegar smack of the beer that had gone off due to age and bad sanitation was a gimme, but trying to taste the different between the “skunky” beer (due to light contamination) and the “cardboard” taste of the beer that’s gone off due to oxidation was much more difficult. Luckily there was a slops bucket into which we could get rid of these beers and it didn’t turn out that drinking this was the penalty for coming last in the beer taste quiz! 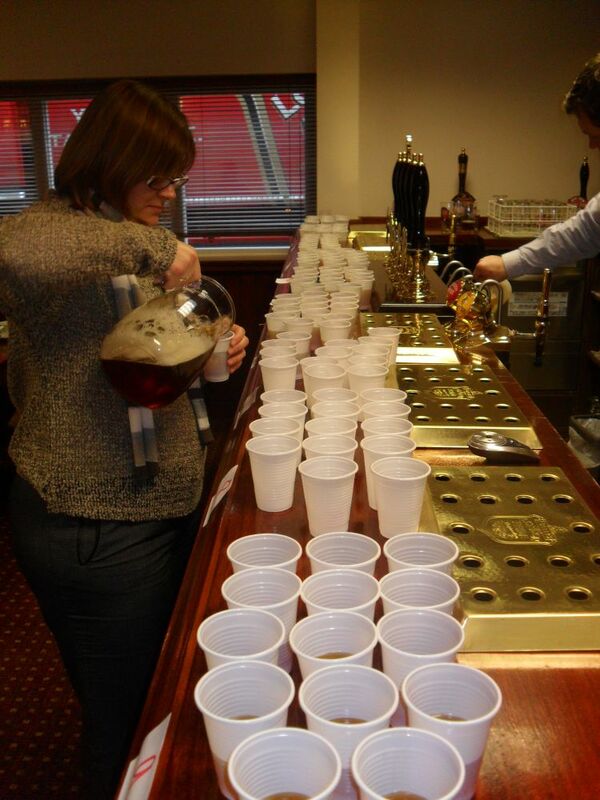 Natalie prepares the "off beer"
We finally rounded up with a session on what we as Cask Marque Ambassadors can do to promote and support Cask Ale and ended with a back slapping photo in front of the training room bar. 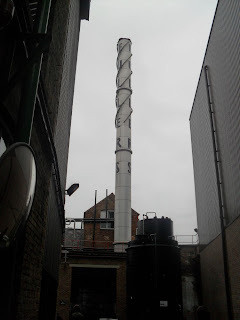 It should go without saying that a day spent at a brewery when I would normally be working is a fine way to spend a Friday, but it is worth praising Cask Marque for the time and effort to lay on such a good day. I’d like to take the opportunity to give a big thank you to Alistair, Natalie and Day (and great to be able to put faces to the names now!) for such an enjoyable day and hope that this report will enthuse those scanners who are edging towards their 100 that the effort to get Ambassador status is well worth it! Alistair and the BGC - Who was more thrilled to meet who?